The 7th International Festival of Students Learning Russian called Friends, our Union is Beautiful! has finished. This year the youth forum successfully tested new format - according to the preferences participants chose a creative workshops and dealt with professional teachers of the chosen subject. Theater workshop (supervised by Alexey Sviridov from Russian Institute of Theatre Arts GITIS film director faculty) taught the students to work in team under the slogan "one for all and all for one!" Trainings for imagination and attention helped students to become better acquainted with the inner world of each workshop participant. During the course the students rehearsed an excerpt from Chekhov's Seagull performed for the closing ceremony of the festival. The workshop of the guitar, poetry and the Russian romance (conducted by of the guitar poetry singer Evgeny Malinovsky from Poland and the laureate of the Romansiada international competition Olga Varvus from Russia) covered peculiarities of different vocal genres. 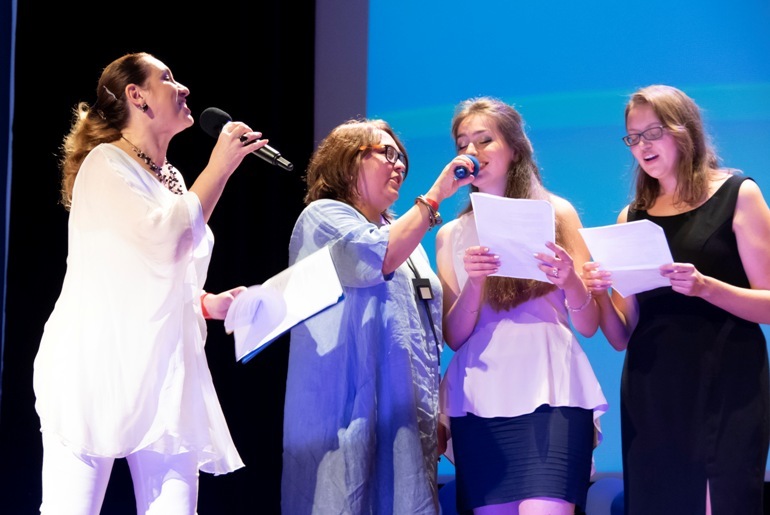 The students learned several well-known Russian songs sung at the final concert. Literature and poetry workshop (Natalia Goltyapina, GITIS senior lecturer of the department of scenic speech) acquainted students with the diction and orthoepic culture of the Russian language, helped to learn their speech and voice capabilities and basic skills of stage speech. Students learned and recited the works of Russian poets. Combining the professional artistic techniques and stage speech skills, they prepared a show for the festival closing ceremony. Young journalist and television reporter workshop (Irina Breusova, TV journalist, teacher of speech technology for telecommunications at the Ostankino Higher School, and Irina Vakulovskaya, head of the RUDN distance learning laboratory for extended education) introduced the genres of television journalism to the audience. Particular attention was paid to the interview, reportage, and news. The students received assignments to analyze the results. Moreover, the students shoot fragments for the final film about the festival shown at the closing ceremony. Photography workshop (photographer Mila Solovyova) covered the features of the reportage photography. Students independently choose a light exposure, adjust a diaphragm, choose picture setup, make their own reportage choosing the right accents, edit pictures, select the best photos and make a slide show. The best photos were presented at the festival closing. Dance workshop (soloist of the Nuremberg Opera and Ballet Theater Ekaterina Fixel) showed the peculiarities of Russian choreography, Russian folk and modern dances. The workshop participants prepared a modern, dynamic dance by the closing of the festival. Man-earth-space workshop (Bulgarian pilot-cosmonaut Krasimir Stoyanov) gave the students the opportunity to carry out on the simulator a manual docking of a manned spacecraft with an orbital station. In the evenings the observation of the stars was organized in the planetarium. The audience also saw space documentaries, a lecture on the universe secrets, an excursion to the Gagarin Cosmonautics Museum in the sports and health complex Kamchia. The Russian geography and history workshop (RUDN assistant professor of the Department of Russian History at the Faculty of Humanitarian and Social Sciences Elena Linkova) acquainted students with the main stages of the formation and development of the Russian state. During the workshop they talked about the great historical figures of Russia, the heroic and tragic pages of its history, the rich culture, traditions, mentality features, the image of Russia on the world stage. The students also learned a lot of new and interesting information about the Russian regions, their features and the general history that unites Russia's peoples. The workshop of Russian cinema and animation (Vyacheslav Shmyrov, GITIS senior teacher of the Russian theater history) introduced masterpieces of Russian and Soviet cinema. The winners of the quizzes organized during the workshop were awarded with memorable gifts at the closing ceremony of the festival. The workshop of Russian language (RUDN teachers of the philological faculty Svetlana Mikova and Inna Rubakova) organized work on improving Russian of the foreign audience taking into account their level of preparation. The students were offered a lesson-game, a lecture on Russian loan-words from the other languages, various tasks for language skills, including writing texts, reading aloud, a quiz, etc. 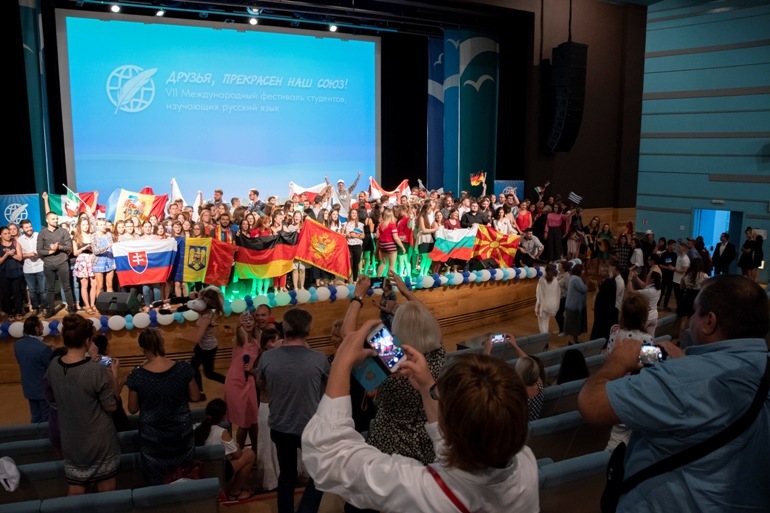 The closing ceremony of the festival actually became a gala concert, at which the magnificent works of talented, energetic, motivated students were presented with the help of highly professional specialists from the best universities of Russia. The applauds after each concert item confirmed this. The new format of the festival fully justified itself. Students improved their Russian and acquired new skills and knowledge in various creative fields. Leaders remark the students' diligence, devotion, and sincere interest to the chosen deal which allowed preparing a vivid performance in a short time. On behalf of the Russkiy Mir Foundation the leaders of student teams and teachers of creative workshops were awarded with honorary diplomas. At the end of the closing ceremony, an evening of national cultures was held where the teams show national musical performances. The Friends, our Union is Beautiful! 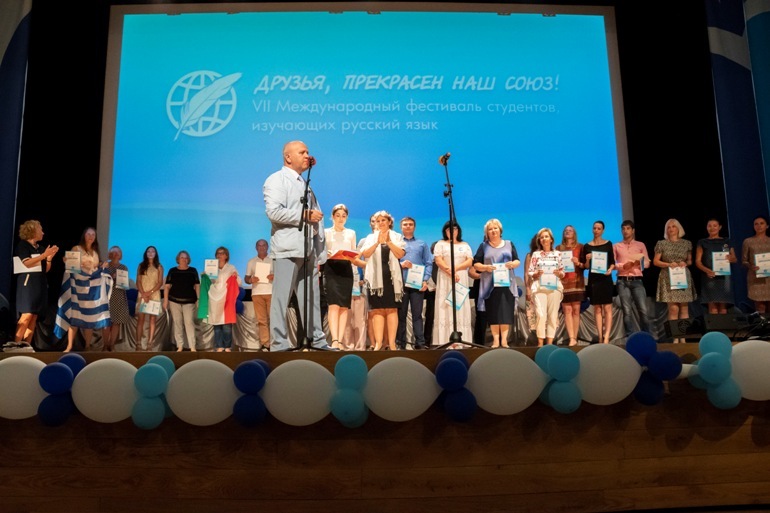 festival successfully held by the Russkiy Mir Foundation for the 7th time, has great importance for its participants. This is confirmed by the excellent reviews of the festival students and the team leaders, the young people desire to come back to Kamchia to meet their peers. A rich program helps to develop its participants both in the possession of the Russian language and in creative ways. The students spent five days in Kamchia with great use and devotion. The days passed very fact, but they will undoubtedly remain for a long time in the participants' hearts.